New Delhi: Tyre major JK Tyre is planning to invest Rs 1,100 crore over the next three years to expand its production capacity as it sees its revenues crossing Rs 5,000 crore marks by then. He added that the company would fund the growth plans through a mix of debt and internal accruals. Mumbai: Worldwide head in Internet networking, Cisco Systems Inc plans to double up its Indian headcount by 2010. As at the end of Q2 FY 07, Cisco India had around 2,800 workers including R&D sales and business support staff. Emap Publishing (Netherland) SV has purchased 40.1 % stake in Next Gen Publishing Ltd., which was a joint venture between the Forbes group and HDFC Ltd to publish special interest magazines and business directories. Emap Publishing is subsidiary of UK-based Emap Plc that one of Europe's largest publishing companies with extensive interests in B2C, B2B, radio, television and digital media. On Saturday, CEO of Next Gen, H S Billimoria said, “The entry of Emap as a partner throws open vast opportunities for Next Gen to become a leading media group in the country,"
On the back of rise in foreign currency and assets collections, Forex reserves soared up by USD 937 million to USD 213.486 billion on June 29 on week-on-week-basis. According to the Reserve Bank of India’s (RBI) weekly statistical supplement released on July 6, 2007, foreign currency and assets reached USD 206.114 billion on the back of USD 936 million rise. The IMF reserve position also came up by USD 1 million to USD 460 million during the same period. On the other hand, gold reserves and the special drawing rights (SDRs) remained unaltered at USD 6,911 million and USD 1 million correspondingly. 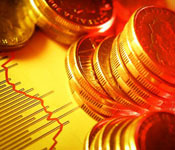 Gold, rebounding on the bullion market on Saturday closed with a gain of Rs 55 at Rs 8,720 per ten gram, and Silver also did show surge on the market. 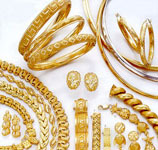 According to Marketmen, fresh buying by retailers and jewellery fabricators on the back of firming trend in overseas markets mainly helped pumping up the gold prices. The Leader in the private sector lending – HDFC Bank has hiked the interest rates on its NRE deposits W.E.F. from July 1. Now, the Deposits of 3 to 5 years maturity will earn an interest of 5.45 % as against the earlier 5.29 % while those of 2 to less than 2 years maturity will earn 5.43 % as compared to 5.31 %. The deposits of maturity between 1 and 2 years will earn 5.42 % rate of interest as against the earlier 5.39 %. Simplex Projects Ltd , Construction Company is reported to hit the capital market on July 10 with its Initial Public Offer to raise up to Rs 55 crore to fund the taking over of plant and machinery and meet the working capital requirement. According to the company officials, the company offers to issue 30 lakh equity shares of Rs 10 each through 100 % book building process. Fixing the price at Rs 170-185 per share, Simplex would raise 51 crore at lower end of the band. The issue will close on July 13. 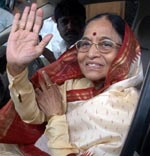 Bhubaneswar: UPA’s presidential applicant Pratibha Patil will visit Bhubaneswar on July 11 to campaign. AICC general secretary V Narayanswamy said Ms. Patil will arrive in the evening and talk with Congress MLAs and MPs and other backing parties at a meeting being planned for the purpose. Dipan Mehta, Member, BSE/NSE is of the view that realty segment is likely to do something to a greater degree. The monument of love – Taj Mahal has become one of the new Seven Wonders of the World. On Saturday night, the symbol of pristine beauty, Taj Mahal was revealed voted in a global poll as one of the new Seven Wonders of the World. 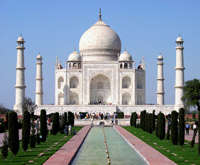 That means, The Taj Mahal has been regarded as one of the most beautiful monuments of the world. New Delhi: The fresh figure of people infected with HIV/AIDS in the country is 2.47 million as compared to the preceding number of 5.2 million. The occurrence rate is also down to 0.36 per cent as against 0.9 per cent. According to novel information for 2006, released on Friday, specify that the national adult HIV frequency is around 0.36 per cent that signifies an estimated 2 million to 3.1 million people living with HIV. Balaji Telefilms was trading on an upper place after benefiting 3.79% to Rs 231.55 as its 10 lakh shares moved in a single block deal at Rs 229.75 per share on NSE. The scrip touched an intraday high of Rs 233.95 and an intraday low of Rs 221.50 during the day. On 22 May 2007, the stock hit a 52-week high of Rs 263 and a 52-week low of Rs 102 on 24 July 2006.
appended 2.48% to Rs 936 during the afternoon trades accompanying its property sale at Gurgaon, India, for Rs 72.75 crore. The scrip’s intraday high was Rs 950 and low Rs 930 during the day. The scrip had 2,063 shares for trading on the BSE counter. In the last four month period, the scrip had an average daily volume of 1,468 shares. Akruti Nirman has announced its fourth quarter results. The company has recorded net profit of Rs 57.18 crore for its fourth quarter ended June 30, 2007, as against Rs 571.8 million in the corresponding period of the last year. The company posted net sales of Rs 92.68 crore as compared to Rs 926.8 million in the same period of the last year..
Thiruvananthapuram: On Thursday, the UPA-Left parties’ presidential applicant assured the State’s MPs and MLAs that she would maintain the unity and power of the country. 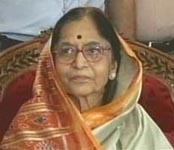 Ms. Patil expressed disappointment at the campaign against her, while addressing MLAs and MPs meeting at Mascot Hotel, who are part of the electoral college of the presidential elections. Ms Patil stated that she always liked Kerala known as Gods Own Country and was indeed happy to meet the MLAs and MPs. The MLAs and MPs belonging to the UDF and the LDF attended the meeting. Yesterday’s trading action witnessed unstable movement. But, the reaction reading of the tradable counters remains optimistic. Today’s bear move is expected to modify the response in their favor. In contrast, the existing upbeat sentiment is ready to be further strengthened. The composition and the position of the top 10 tradable list experienced minor alterations. Bank of India made its way to top 10 list obtruding Satyam. BOI occupied last place in the list. The BSE 30-share Sensex penetrated the sensitively important 15,000 mark during the afternoon trades. The Sensex took seven months to cover up this level from 14,000 to 15,000. On December 2006, the stock index hit 14,000 mark for the first time. On the contrary, it had taken just 26 trading sessions to reach the 14,000 level after it had first struck the 13,000 mark on 30 October 2006. New Delhi: A total of 14 challengers will symbolize India at the in Ostrava, Czech Republic from July 11 to 15. The group consisting six boys and eight girls, comprise three athletes from Delhi. They are Sahil Mahindra, Ajay Pal Singh and Ajaj Ahmed. The selected team has three members from Kerala whereas two girl athletes are from Orissa for the girls' 4x400m relay. Uttar Pradesh, Punjab, Haryana, Maharashtra, Karnataka, and West Bengal have one representative each. Mumbai: SBI Mutual Fund has crossed Rs 20,000-crore mark in assets under management (AUM) as on 30 June, 2007. SBI MF has an investor base of over 35-lakh spread over 40 schemes.